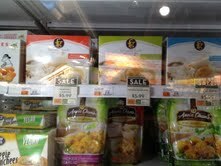 After being assured by @HealthyLiving that @FellGoodFoods #GlutenFree dumplings are available, I had to investigate. I couldn’t imagine I’d missed them in the GF freezer section, how could I not *notice* something so great? Indeed, it turns out they’re in the regular freezer section and come in four flavors– pork, chicken, veggie and shrimp. Better yet– they’re on sale! Get on out there while the getting is good! I followed the directions (ok, I didn’t have a truly non-stick pan…) but my dumplings stuck to the pan. Still totally delicious! Wonderful surprise was realizing they come with dipping sauce, yummm. Why is it we call “dumplings” potstickers on the west coast? They seem like the same thing to me!? This entry was posted in Burlington, Grocery Stores, Prepared foods on October 4, 2012 by gfvermont.